San Francisco seen from Tiburon: The first settlement was established by Spanish missionaries i 1776. The territory passed to Mexico after independence in 1821. However, it was ceded to the United States after the US-Mexican War, which ended in 1847. This was just in time for the gold rush; By the end of 1849 the population had grown from 1,000 from the year before to 25,000. 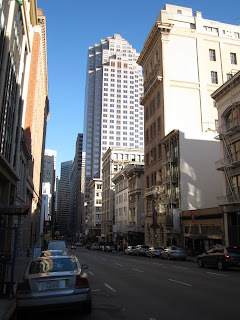 San Francisco was given the status of city-county in 1856. About three quarters of the city and almost all of downtown was destroyed in the earthquake of 1906. By that time, the population had reached 400,000. The city was soon rebuilt and has a current population of around 800,000, making it the 14th most populous city in the United States. The Transamerica Pyramid is the tallest skyscraper in San Francisco. It was designed by the architect William Pereira and completed in 1972. 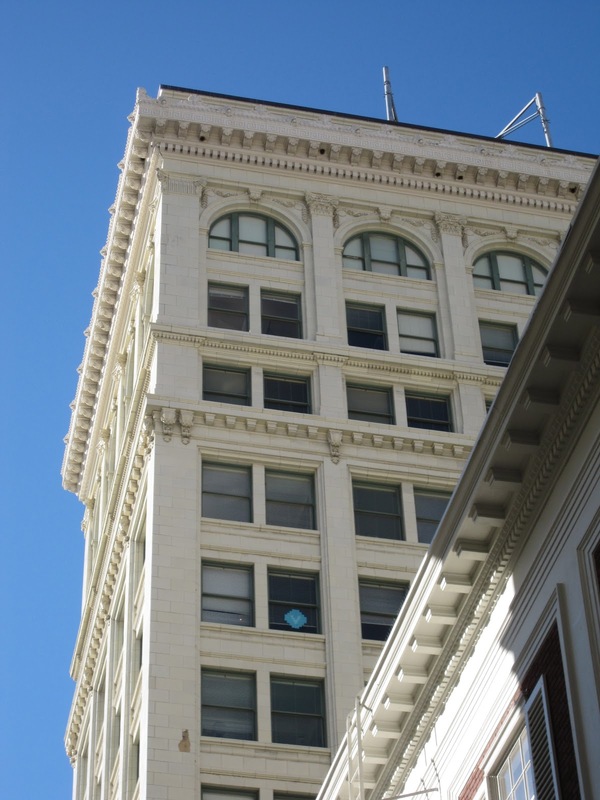 The site was previously occupied by the Montgomery block, which was built in four storeys in 1853, as the first fireproof and earthquake resistant building in the city. It was demolished in 1959 and the site was used as a parking lot for about ten years. Restrictions on the permitted total amount of floor space seems to have been the deciding factor leading to the tapering design. There are 260 metres to the roof. Coit Tower was built at the summit of Telegraph Hill in 1933. It was built using funds bequeathed from Lillie Hitchcock Coit for the beautification of the city. The tower was designed by Arthur Brown Jr. and Henry Howard. 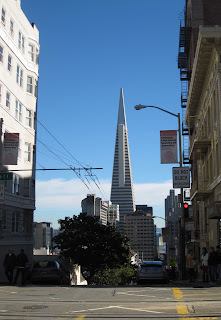 The view of downtown includes Transamerica Pyramid, the Bank of America Centre, and One Maritime Plaza. Addison Head Building (201-209 Post Street) was constructed in 1909 to the design of architects William Curlett & Sons. The base was remodelled in 1959 by William B. Meyer for the Brooks Brothers, and the building has also been known as the Brooks Brothers Building, or the Howard Building. Bush Street from Grant Avenue: The tower is 333 Bush Street, constructed by Skidmore, Owings & Merrill in 1986. Heigh to roof is 151 metres. 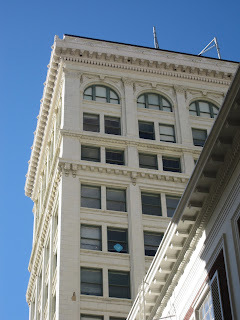 The Union Trust Company Building (744 Market Street) was built in 1910 and was designed by the architect Clinton Day. Union Trust merged with Wells Fargo Bank in 1923 and the building is still a bank branch for Wells Fargo. Across the street stands another classical building from 1910, built for the Savings Union Bank (1 Grant Avenue). Sansome Street, seen from Bush Street: The Royal Insurance Building (201 Sansome Street) was built in 1906 as the first commercial building after the earthquake. It was designed by architects Howells & Stokes. The base is of white marble, while the rest of the building is in red brick with ornaments in green and white terracotta. There is a finely carved marble clock over the entrance with a lion and unicorn. The doors in the elevator lobby are from a seventeenth century Italian palazzo. 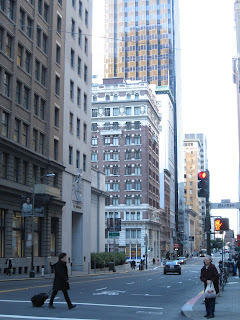 Towering above is Bank of America Centre (555 California Street). It is the second tallest skyscraper in San Francisco with a height of 237 metres. It was completed in 1969. Architects: Skidmore, Owings and Merrill, Wurster, Benardi and Emmons. The Postal Telegraph Building (22 Battery Street) was constructed in 1908 by the architect Lewis Parsons Hobart. The building has also been known as the Union Carbide & Carbon Building.